The bach is nestled among mature totara trees and is home to many native birds. It has a lovely open garden and an extensive view across the estuary which will fill up during spring high tides. It is only a 30 second walk across the other side of the road to a very safe swimming beach. 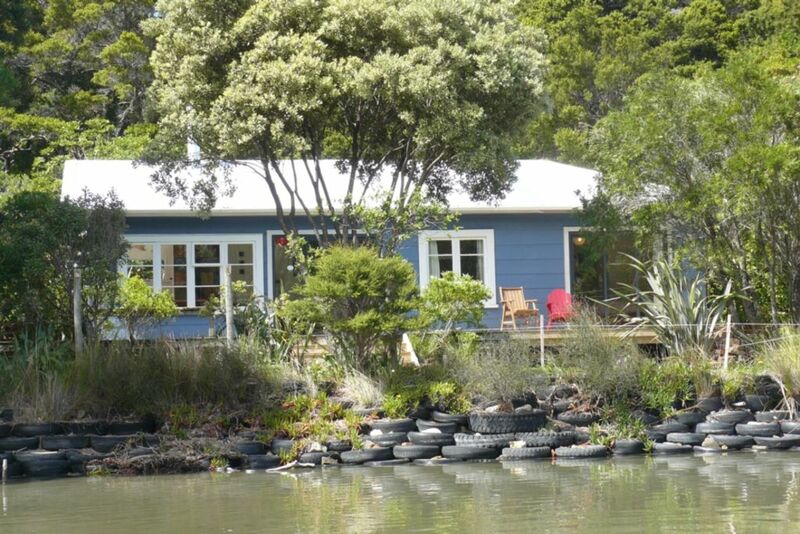 There are two kayaks to use and the garden and estuary are interesting safe places for children to play while parents sit and relax on the deck. The living area is open and cosy with an efficient wood burner to keep the house warm in the winter months. There are two good sized bedrooms that look across the estuary and are both light and well insulated; the larger bedroom has double glazing. A new bathroom has been recently added to the bach and the living room extended. It is a great place to escape and relax and offers long beach walks where you can observe the many wading birds, collect shellfish or just beach fossick. There are many beautiful natural locations nearby to visit by car including Wharariki beach which is only a 20 minute drive. Whatever you choose to do you will come home feeling better for taking the time to stay here. The house is very suitable for couples or a small family. The deck is less than a meter high and has not got railings, therefore would not be suitable for a toddler or baby without supervision. During the peak summer season a minimum booking for 2 nights is required. A perfect stepping stone to beautiful and iconic New Zealand attractions such as Wharariki beach. large car port to park under on property. The place was tidy and easy to keep clean. It had everything we needed and we felt at home. Helpful and friendly owner, who genuinely wants people to enjoy her bach. Thank you for sharing your charming bach. Gunado is clean and comfortable and the beds are good. We enjoyed gathering cockles, the stars at night, swimming and exploring the Collingwood end of Golden Bay. If you are reasonably fit, a walk up to Knuckle Hill is worthwhile for the views. And the Mad cafe in Collingwood does good coffee. Great and comfortable bach, which had everything we needed! Thoroughly enjoyed our stay!! Great value for money, comfortable beds, well equipped kitchen, tasteful interior, nice location, books, helpful local information, good communication with bach owner....the list could go on. Can't recommend this bach highly enough. Thanks for the great review. I like to hear people have had a lovely time. Please come back. Spent a few lovely days here with our kids. Good location to explore the entire Golden Bay area. Had fun with the kayaks.